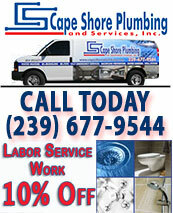 Many plumbing leaks are located where you cannot see them. When you have pipes leaking underground, below your property’s foundation, or behind interior or exterior walls, and they are left untreated, they can cause thousands of dollars in structural damage if left untreated. Cape Shore Plumbing’s expert plumbing technicians use non-invasive, state-of-the-art leak detection equipment in order to accurately locate costly leaks in your plumbing system. By using camera views and camera inspections for leak detection, you can avoid digging up your property, inconvenience and . By utilizing our video, camera view, infrared and ultrasonic leak detection methods, we save you money, time, water, and unnecessary damage to your property. 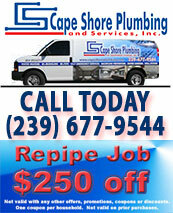 Cape Shore Plumbing resolves all your plumbing leak detection needs by first using sewer camera inspections, drain camera inspections, or camera pipe inspection to locate the nature and source of the problem. Our expert technicians determine the location of a leak by electronically pinpointing its source. With our highly sophisticated camera pipe inspections, we can accurately locate even the smallest pipe defect that is causing the leak. 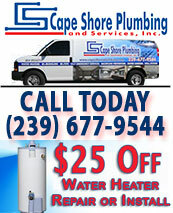 One call to Cape Shore Plumbing at (239) 677-9544, SWFL’s skilled leak detection specialists, as soon as you suspect that there is a leak in your plumbing system, guarantees that you have begun the process that will save you money, halt the potential destruction of your property, and restore your peace of mind. When a professional leak detector is required inside or outside your home or business, don’t delay. Make the call today. Preventative action is by far the best way to avoid serious issues.